The invention discloses a virtual machine management system and a method. The method comprises steps: an upgrading operation and a degrading operation of a first virtual machine can be received, wherein the first virtual machine is chosen by a user; entity machines can be searched in a data center; a second virtual machine can be generated in the searched entity machines, wherein the second virtual machine is in a specification appointed by the user; at a first time point, data of the first virtual machine can be copied to the second virtual machine; the first virtual machine and the second virtual machine can be controlled to be in a concurrent operation in a period of time until the data of the first virtual machine is complete copied to the second virtual machine; at a second time point, the concurrent operation of the first virtual machine and the second virtual machine can be stopped, when the concurrent operation of the first virtual machine and the second virtual machine is stopped, the operation of the first virtual machine can be stopped, cloud computing resource occupied by the first virtual machine can be released. The virtual machine management system and the method can be utilized to automatically complete an up-gradation and a degradation of the virtual machine. 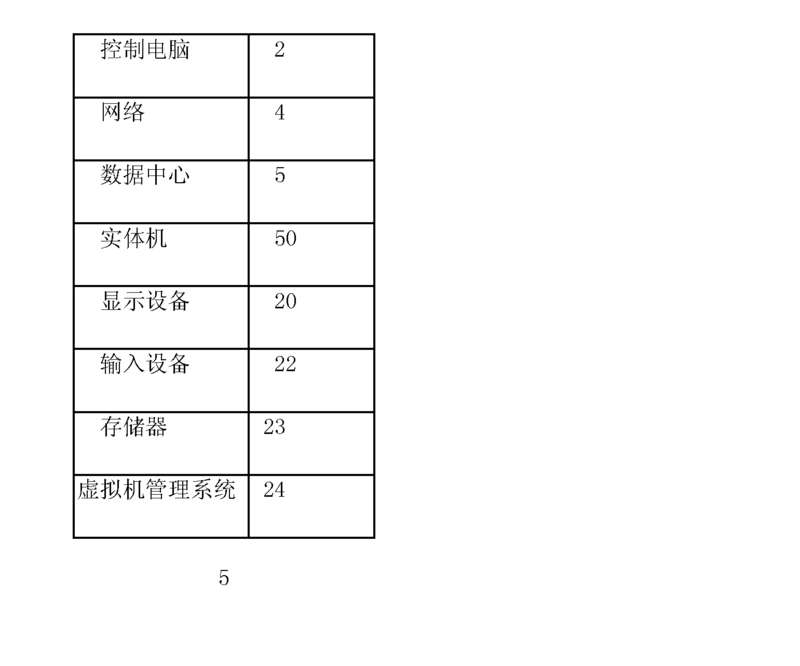 具体实施方式 如图1所示，是本发明控制电脑的应用环境示意图。  DETAILED DESCRIPTION  Figure 1, is a block schematic diagram of the computer control of the present invention. 在本实施例中，所述控制电脑2通过网络4与数据中心5相连,所述数据中心5内含多台实体机50 (Physical Machine,如服务器)，通常都有上百台。 In the present embodiment, the control computer 2 via the network 4 is connected to the Data Center 5, 5 of the data center contains a plurality of physical machines 50 (Physical Machine, such as a server), typically have hundreds. 所述网络4可以是企业内部网(Intranet)，也可以是互联网(Internet)或其它类型的通讯网络，如GPRS、Wi_Fi/WLAN、3G/WCDMA、3.5G/HSDPA 等。 The network 4 may be an intranet (Intranet), it may also be the Internet (Internet) or other types of communications networks, such as GPRS, Wi_Fi / WLAN, 3G / WCDMA, 3.5G / HSDPA and so on. 所述控制电脑2以网页形式提供一个用户界面，当需要对数据中心5的实体机50上的虚拟机进行升级/降级操作时，管理人员可以通过该用户界面进行相应操作。  The control computer 2 provides a user interface as a Web page, when the need for virtual machines on physical machines in the data center 50 5 upgrade / downgrade operations, administration can be operated by the user interface accordingly. 参阅图2所示，该控制电脑2包括通过数据总线相连的显示设备20、输入设备22、存储器23、虚拟机管理系统24和处理器25。  Referring to FIG. 2, the control computer 2 includes a display device 20 connected through a data bus, an input device 22, a memory 23, a virtual machine management system 24 and a processor 25. 所述存储器23用于存储所述虚拟机管理系统24的程序代码等资料。 The  memory 23 for storing the program code, virtual machine management system 24 and other data. 所述显示设备20用于显示实体机50上的虚拟机资料等。 The display device 20 for displaying information and other virtual machines on physical machines 50. 所述输入设备22用于输入用户设置的各种数据，如虚拟机规格等。 The data input device 22 for inputting various user settings, such as virtual machine specifications. 其中，所述虚拟机规格包括，但不限于，虚拟机所占用的CPU数量、内存大小和硬盘大小等。 Wherein the virtual machine specifications include, but are not limited to, the number of occupied virtual machine CPU, memory size, and a hard disk size. 所述虚拟机管理系统24用于接收用户通过网页点选的对所选择虚拟机的升级/降级操作，并在不中断所选择虚拟机运行的情况下，自动完成所选择虚拟机的升级/降级操作，具体过程以下描述。  The virtual machine management system for upgrading virtual machines 24 / downgrade the selected receiving user clicked through the Web page, and without interrupting the operation of the selected virtual machine, the automatic completion of the selected virtual machine upgrade / downgrade specific process described below. 在本实施例中，所述虚拟机管理系统24可以被分割成一个或多个模块，所述一个或多个模块被存储在所述存储器23中并被配置成由一个或多个处理器(本实施例为一个处理器25)执行，以完成本发明。  In the present embodiment, the virtual machine management system 24 may be partitioned into one or more modules, the one or more modules 23 are stored in the memory and configured to store one or more a processor (a processor of the present embodiment 25) performed to complete the present invention. 例如，参阅图3所示，所述虚拟机管理系统24被分割成指令接收模块201、搜寻模块202、生成模块203、同步模块204和删除模块205。 For example, refer to FIG. 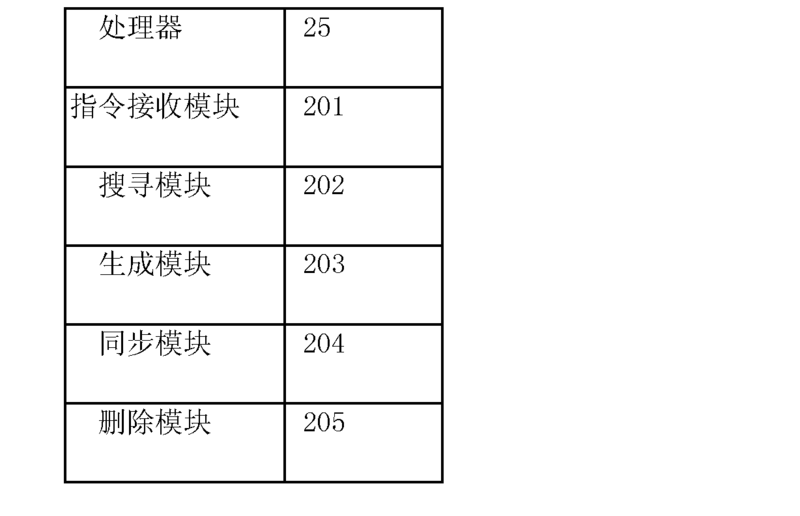 3, the virtual machine management system 24 is divided into instruction receiving module 201, search module 202, a generating module 203, a synchronization module 204, and a deleting module 205. 本发明所称的模块是完成一特定功能的程序段，比程序更适合于描述软件在控制电脑2中的执行过程。 Module of the present invention is referred to complete a specific function block, to be described more programs during execution of software in the control computer 2. 如图4所示，是本发明虚拟机管理方法的较佳实施例的流程图。  As shown in FIG 4 is a flowchart of one embodiment of a virtual machine management method of the present invention. 步骤SI，指令接收模块201接收用户通过网页选择的第一虚拟机的升级或降级操作，并接收用户指定的需要生成的第二虚拟机的规格。  Step the SI, the instruction receiving module upgrade or downgrade operation of the first virtual machine 201 receives the user selection through the web page, and receiving specification of a second virtual machine designated by the user need to be generated. 所述第二虚拟机的规格包括:第二虚拟机所占用的CPU数量、内存大小和硬盘大小等。 Specifications of the second virtual machine comprising: a number of second virtual machine CPU occupied, the size of memory and hard disk size. 步骤S2，搜寻模块202在数据中心5中搜寻实体机50，判断该实体机50是否有足够的云计算资源可生成用户指定规格的第二虚拟机。  step S2, the search module 202 searches the physical machine in the data center 50 5, the entity device 50 determines whether there are sufficient resources to cloud computing may generate a user-specified second virtual machine specification. 如果该实体机50有足够的云计算资源可生成用户指定规格的第二虚拟机，则执行步骤S3。 If the entity device 50 has sufficient cloud computing resources may generate user-specified second virtual machine specification, proceed to step S3. 如果数据中心5的实体机50都没有足够的云计算资源可生成用户指定规格的第二虚拟机，则搜寻模块202输出无法升级或降级的信息至显示设备20上，流程结束。 If the data center physical machine 5 50 do not have enough resources to cloud computing specifications designated by the user may generate a second virtual machine, the search module 202 outputs the information can not be upgraded or downgraded to a display device 20, the process ends. 其中，所述云计算资源包括，但不限于，实体机50的CPU数量、内存大小和硬盘大小等。 Wherein the cloud computing resources include, but are not limited to, the number of physical machine CPU, memory size, and a hard disk size is 50. 步骤S3，生成模块203在所搜寻到的实体机50中生成该用户指定规格的第二虚拟机。  In step S3, the generating module 203 generates the subscriber 50 specified in the specifications of the second virtual machine to search the physical machine. 步骤S4,同步模块204在第一时间点tl将第一虚拟机的数据复制(同步)到第二虚拟机。  Step S4, the synchronization module 204 copies the data of the first virtual machine at a first time point TL (synchronized) to the second virtual machine. 在本实施例中，第一时间点tl为该第二虚拟机的生成时间。 In the present embodiment, the first time point tl for a second time to generate a virtual machine. 可以理解，在其他实施例中，第一时间点tl也可以为该第二虚拟机的生成时间加上一段预设的延迟时间(如2秒钟)。 It will be appreciated that in other embodiments, the first time point tl may generate a second virtual machine plus the time for a predetermined time delay (e.g. 2 seconds) for. 例如，假设该第二虚拟机的生成时间为8:30:40,则tl = 8:30:40 (h/m/s)或tl =8:30:42。 For example, suppose that the second virtual machine generating the time is 8:30:40, then tl = 8:30:40 (h / m / s) or tl = 8: 30: 42. 步骤S5，同步模块204控制第一虚拟机和第二虚拟机并行运行一段时间(即一个指令在第一虚拟机和第二虚拟机间重复操作)，直到第一虚拟机的数据全部复制到第二虚拟机。  Step S5, the synchronization module 204 controls the first virtual machine and the second virtual machine to run in parallel for some time (i.e., a repeat operation instruction between the first virtual machine and the second virtual machine), until all the data of the first virtual machine copied to the second virtual machine. 例如，假设第一虚拟机存在三个数据Datal、Data2、Data3，其中，Datal正在运行，Data2和Data3处于停止状态。 For example, assume there are three data Datal, Data2, Data3 first virtual machine, wherein, running Datal, Data2, and Data3 in a stopped state. 则同步模块204先将Data2和Data3复制到第二虚拟机，然后控制第一虚拟机和第二虚拟机并行运行。 Copy the synchronization module 204 and the Data2 Data3 first to a second virtual machine, and then controls the first virtual machine and the second virtual machine to run in parallel. 当Datal处于停止状态后，再将Datal也复制到第二虚拟机。 When Datal is stopped, then Datal also copied to the second virtual machine. 步骤S6,同步模块204运用容错技术(Fault Tolerance, FT),在第二时间点t2停止第一虚拟机和第二虚拟机的并行操作。  Step S6, the synchronization module 204 using fault tolerance (Fault Tolerance, FT), the first virtual machine is stopped and the second virtual machine at a second time point t2 parallel operation. 在本实施例中，第二时间点t2为第一虚拟机的数据全部复制到第二虚拟机的时间。 In the present embodiment, the second time point t2 of the first virtual machine data copied to the second virtual machine time. 可以理解，在其他实施例中，第二时间点t2也可以为第一虚拟机的数据全部复制到第二虚拟机的时间加上一段预设的延迟时间(如4秒钟)。 It will be appreciated that in other embodiments, the second time point t2 may be a data of the first virtual machine a second time to copy all the virtual machine plus a preset delay time (e.g., 4 seconds). 例如，假设第一虚拟机的数据全部复制到第二虚拟机的时间为8:40:50，则t2 = 8:40:50 (h/m/s)或t2 = 8:40:54。 For example, assume that the data of the first virtual machine is copied to a second virtual machine time is 8:40:50, then t2 = 8:40:50 (h / m / s) or t2 = 8:40:54. 步骤S7，当第一虚拟机和第二虚拟机的并行操作停止后，删除模块205停止第一虚拟机的运行，并释放第一虚拟机占用的云计算资源，移转结束。  step S7, after the parallel operation of the first virtual machine and the second virtual machine is stopped, deleting module 205 stops operation of the first virtual machine, and to release the cloud computing resource occupied by the first virtual machine, transfer ends. 以下以一个实例说明如何进行虚拟机升级操作。  In the following example of how a virtual machine upgrade. 假设用户选择的第一虚拟机为iVM-S: (CPU*K RAM: 2GB、HD: 200GB)，用户指定的需要生成的第二虚拟机为iVM-XL:(CPU*8、RAM: 16GB、HD:1600GB)。  Assume that the user selected first virtual machine iVM-S: (CPU * K RAM: 2GB, HD: 200GB), designated by the user need to generate a second virtual machine is iVM-XL: (CPU * 8, RAM : 16GB, HD: 1600GB). 例如，参阅图5A和图5B所示，可以根据虚拟机的大小将虚拟机分为三类:小台虚拟机(iVM-S)、中台虚拟机(iVM-M)和大台虚拟机(iVM-XL)。 For example, referring to Figure 5A and FIG, according to the size of the virtual machine VM 5B is divided into three categories: small virtual machine (iVM-S), the virtual machine (iVM-M) and large virtual machines ( iVM-XL). (I)用户通过网页将iVM-S升级为iVM-XL。  (I) the user iVM-S upgraded iVM-XL via the web. 虚拟机管理系统24自动搜寻数据中心5里的实体机50是否有足够空间可做为iVM-XL使用。 24 virtual machine management system automatically search for data center 5 in the physical machine 50 if there is enough space to use as iVM-XL. 若无足够空间，则显示无法升级，若有足够空间，则: (2)先生成第二虚拟机iVM-XL，参阅图5B所示。 If there is no sufficient space, the display can not be upgraded, if there is sufficient space, then:  (2) a second virtual machine Mr. iVM-XL, refer to FIG. 5B. 在第一时间点tl将iVM_S上的数据复制到iVM-XL，参阅图5C所示。 At a first time point tl to copy data on to iVM_S iVM-XL, 5C shown refer to FIG. 此时，iVM-S保持运行并与iVM_XL做同步化(Synchronization)。 At this time, iVM-S keeps running and make synchronization with iVM_XL (Synchronization). (3) iVM-S与iVM-XL并行运行一段时间。  (3) iVM-S iVM-XL run in parallel with a period of time. 此时，一个指令在iVM_S与iVM_XL间重复操作，参阅图5D所示。 At this time, an instruction to repeat the operation between iVM_S iVM_XL, 5D shown refer to FIG. (4)运用容错技术，在第二时间点t2结束并行操作，最终释放iVM-S资源，移转结束，参阅图5E所示。  (4) the use of fault tolerance, the second time point t2 at the end of the parallel operation, the final release resources iVM-S, the end of transfer, see FIG. 5E. 最后应说明的是，以上实施例仅用以说明本发明的技术方案而非限制，尽管参照较佳实施例对本发明进行了详细说明，本领域的普通技术人员应当理解，可以对本发明的技术方案进行修改或等同替换，而不脱离本发明技术方案的精神和范围。  Finally, it should be noted that the above embodiments are intended to illustrate and not limit the present invention, although the present invention has been described in detail with reference to preferred embodiments, those of ordinary skill in the art should be understood that the present invention the technical solution changes or modifications without departing from the spirit and scope of the technical solutions of the present invention. 1.一种虚拟机管理系统，应用于控制电脑中，该控制电脑与内含多台实体机的数据中心相连，其特征在于，该系统包括: 指令接收模块，用于接收用户选择的第一虚拟机的升级或降级操作； 搜寻模块，用于在该数据中心中搜寻实体机，该搜寻到的实体机具有足够的云计算资源可生成用户指定规格的第二虚拟机； 生成模块，用于在所搜寻到的实体机中生成该用户指定规格的第二虚拟机； 同步模块，用于在第一时间点将第一虚拟机的数据复制到第二虚拟机； 所述同步模块，还用于控制第一虚拟机和第二虚拟机并行运行一段时间，直到第一虚拟机的数据全部复制到第二虚拟机； 所述同步模块，还用于在第二时间点停止第一虚拟机和第二虚拟机的并行操作；及删除模块，用于当第一虚拟机和第二虚拟机的并行操作停止后，停止第一虚拟机的运行，并释放 A virtual machine management system, used to control the computer, the control computer and containing a plurality of physical machine is connected to a data center, wherein, the system comprising: an instruction receiving module, configured to receive a first user selection virtual machine upgrade or downgrade; search means for searching the data center physical machine, the machine will find entity with sufficient resources to cloud computing specifications designated by the user may generate a second virtual machine; generating module, for generating a specification specified by the user in search of a second physical machine to a virtual machine; synchronization means for copying the data to the second virtual machine at a first time point of the first virtual machine; the synchronization module is further use parallel to the first virtual machine and the control of a second virtual machine to run for some time, until all the data is copied to the first virtual machine a second virtual machine; the synchronization module is further configured to stop the first virtual machine and the second point in time parallel operation of the second virtual machine; and a deleting module, configured to, when the parallel operation of the first virtual machine and the second virtual machine is stopped to stop operation of the first virtual machine, and release 一虚拟机占用的云计算资源。 A virtual machine takes cloud computing resources. 2.如权利要求1所述的虚拟机管理系统，其特征在于，所述云计算资源包括:实体机的CPU数量、内存大小和硬盘大小。 2. The virtual machine management system according to claim 1, wherein the cloud computing resource includes: the number of the physical machine's CPU, hard disk size and memory size. 3.如权利要求1所述的虚拟机管理系统，其特征在于，所述用户指定规格包括:第二虚拟机所占用的CPU数量、内存大小和硬盘大小。 Virtual machine management system according to claim 1, wherein the user-specified specifications include: the amount of CPU occupied by the second virtual machine, memory size, and hard disk size. 4.如权利要求1所述的虚拟机管理系统，其特征在于，所述第一时间点为该第二虚拟机的生成时间，或该第二虚拟机的生成时间加上一段预设的延迟时间。 4. The virtual machine management system according to claim 1, wherein said first time point generation time of the second time generating a virtual machine, or the second virtual machine for a preset period of delay plus time. 5.如权利要求1所述的虚拟机管理系统，其特征在于，所述第二时间点为第一虚拟机的数据全部复制到第二虚拟机的时间，或第一虚拟机的数据全部复制到第二虚拟机的时间加上一段预设的延迟时间。 5. The virtual machine management system according to claim 1, wherein the second time point of the first virtual machine all the data copied to the second virtual machine time, or all of the data of the first virtual machine replication time to add a second virtual machine for a preset delay time. 6.一种虚拟机管理方法，运行于控制电脑中，该控制电脑与内含多台实体机的数据中心相连，其特征在于，该方法包括如下步骤: 指令接收步骤，接收用户选择的第一虚拟机的升级或降级操作； 搜寻步骤，在该数据中心中搜寻实体机，该搜寻到的实体机具有足够的云计算资源可生成用户指定规格的第二虚拟机； 生成步骤，在所搜寻到的实体机中生成该用户指定规格的第二虚拟机； 第一同步步骤，在第一时间点将第一虚拟机的数据复制到第二虚拟机； 第二同步步骤，控制第一虚拟机和第二虚拟机并行运行一段时间，直到第一虚拟机的数据全部复制到第二虚拟机； 第三同步步骤，在第二时间点停止第一虚拟机和第二虚拟机的并行操作；及删除步骤，当第一虚拟机和第二虚拟机的并行操作停止后，停止第一虚拟机的运行，并释放第一虚拟机占用的云计 A method of managing a virtual machine, running in the control computer, the control computer and containing a plurality of physical machine is connected to a data center, wherein, the method comprising the steps of: an instruction receiving step of receiving a first user selection upgrade or downgrade operation of the virtual machine; search step of searching the data center physical machine, the machine will find entity with sufficient resources to cloud computing specifications designated by the user may generate a second virtual machine; generating step, to the search entity specified by the user specification unit generating a second virtual machine; a first synchronization step, data is copied at a first time point of the first virtual machine to a second virtual machine; second synchronization step of controlling first virtual machine and a second virtual machine to run in parallel for some time, until all the data is copied to the first virtual machine a second virtual machine; third synchronization step, a second time to stop at the point of the first virtual machine operating in parallel and the second virtual machine; and deleted step, after the parallel operation of the first virtual machine and the second virtual machine is stopped to stop operation of the first virtual machine, and releases the first virtual machine occupied cloud 资源。 Resources. 7.如权利要求6所述的虚拟机管理方法，其特征在于，所述云计算资源包括:实体机的CPU数量、内存大小和硬盘大小。 7. The virtual machine management method according to claim 6, wherein the cloud computing resource includes: the number of the physical machine's CPU, hard disk size and memory size. 8.如权利要求6所述的虚拟机管理方法，其特征在于，所述用户指定规格包括:第二虚拟机所占用的CPU数量、内存大小和硬盘大小。 8. The virtual machine management method according to claim 6, wherein the user-specified specifications include: the amount of CPU occupied by the second virtual machine, memory size, and hard disk size. 9.如权利要求6所述的虚拟机管理方法， 其特征在于，所述第一时间点为该第二虚拟机的生成时间，或该第二虚拟机的生成时间加上一段预设的延迟时间。 9. The virtual machine management method according to claim 6, wherein the first time point for the second time to generate a virtual machine, or the generation time of the second virtual machine plus a preset delay time. 10.如权利要求6所述的虚拟机管理方法，其特征在于，所述第二时间点为第一虚拟机的数据全部复制到第二虚拟机的时间，或第一虚拟机的数据全部复制到第二虚拟机的时间加上一段预设的延迟时间。 10. The virtual machine management method according to claim 6, wherein the second time point of the first virtual machine all the data copied to the second virtual machine time, or all of the data of the first virtual machine replication time to add a second virtual machine for a preset delay time.